Shane Plazibat, Principal and Founder of Plazibat Architects, is a highly awarded Australian architect with 25 years’ experience. Having worked on major civic, hospitality and recreation projects in Hong Kong, London and Australia, his designs are a lesson in sophistication. 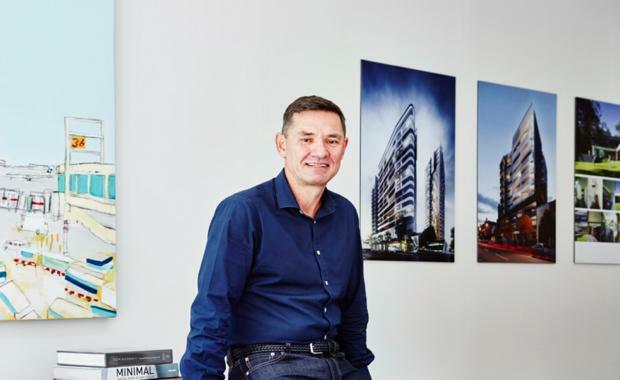 Shane talks about the new generation of multi-residential design that is challenging developers to open up spaces for community and reshaping Australia’s notion of high-density living. Many of your multi residential designs have village appeal. What inspires you to design this way? I lived in Chelsea, London, in an apartment on a green square. We got to know a lot of the other people around the square, as the garden became a common ground for leisure and recreation. It was a mini village within the village of Chelsea and has inspired me to re-create this atmosphere in my designs. A sense of community and belonging is just as important now as it was 50 years ago. Favouring capacity over experience makes it hard for people to connect. Giving people space to socialise creates a more appealing living experience. Developers may be hesitant to ‘give-up’ profitable space for community. What are the business benefits of incorporating more green space? What you sacrifice in capacity you gain in value. This is particularly true in attracting commercial tenants at ground level, where green space can boost retail and leisure spending. Verdant community spaces create a sense of place and a degree of ownership by the residents, and contribute to the attractiveness of the location – all of which increases market value. It also makes apartment living seem bigger. Certain spaces such as courts and gardens can be seen as an extension of residents’ spaces - like a backyard - so it is a marketable feature. Having areas to unwind and socialise make apartment living an attractive long-term option. What are the key design considerations when designing green space? Shade is a major consideration. Mature trees, vegetation, and shelters need to be as lush as they are functional. Tranquil water features and public art are big draw cards for creating village appeal, as are family friendly spaces that allow children to play freely while parents can relax and observe. How do you encourage a sense of community in your design? In every public space, I think about how I can help people connect. Gyms, for example, are no longer a stable of equipment. I’m designing fitness centres that encourage people to gather and socialise. Also, there’s more fluidity in the design. An open-air meditation space could transform into a climate controlled yoga room. The design doesn’t dictate function and can adapt to peoples’ interests. We’re creating areas to facilitate social events and games. Activities like croquet and bocce are really popular at the moment. We entice people with outdoor cinemas and pop up food carts. It’s all about creating a buzzing business marketplace. What do today’s buyers expect from multi-residential living? Residents want amenities that simplify a busy modern life. For example, storage for delivery of internet shopping and cool rooms for food deliveries are essential. People are buying into the idea of a holiday at home. Roof top pools, bars and private bungalows – there’s a real appetite for everyday luxury. In terms of apartment design, people want large usable balconies that blur the lines of indoor and outdoor living spaces. Flex rooms and greater flexibility in planning are big draw cards in attracting multi-generational buyers with vastly different living needs.